Families everywhere can now bring home the magic of Disney’s Academy Award-winning animated musical hit Frozen on 2-Disc Collector’s Edition Blu-ray Combo Pack, DVD, Digital HD and On-Demand. In Frozen, fearless optimist Anna sets off on an epic journey — teaming up with rugged mountain man Kristoff and his loyal reindeer Sven — to find her sister Elsa, whose icy powers have trapped the kingdom of Arendelle in eternal winter. Encountering Everest-like conditions, mystical trolls and a hilarious snowman named Olaf, Anna and Kristoff battle the elements in a race to save the kingdom. What makes Frozen different form other Disney tales is that it’s not the typical, “Happily Ever After” story. Without revealing too many details, the whole Prince Charming comes to save Princess plot is totally revised. In Frozen, the protagonist takes control of her own destiny and doesn’t wait for someone to save her. While taking control of her destiny, she grows as a person and learns her own strengths. I also love that Frozen shows children the importance of family and that a love of a family member can be a sort of ‘true love’. Frozen shows the important of accepting yourself for who you are. Elsa learns that ignoring her icy powers doesn’t prevent her from turning the kingdom to ice. In order, for her to control her powers she must first embrace her uniqueness. She also must let the people who care about her in. What really sets elevates Frozen from other animated movies are the original songs by the married duo Kristen Anderson-Lopez and Robert Lopez. Every song was catchy and I felt each strengthen the feel of the movie. My favorites are – For the First Time in Forever, Love is an Open Door, In Summer (sung by the loveable Olaf), Let it Go and Fixer Upper. – Original Theatrical Short – Get A Horse! In celebration of the release, Disney has released the below fun friendship activities inspired by the film! Make your own princess capes and honor a relationship with a sister or someone who is like a sister to you with sister bracelets! 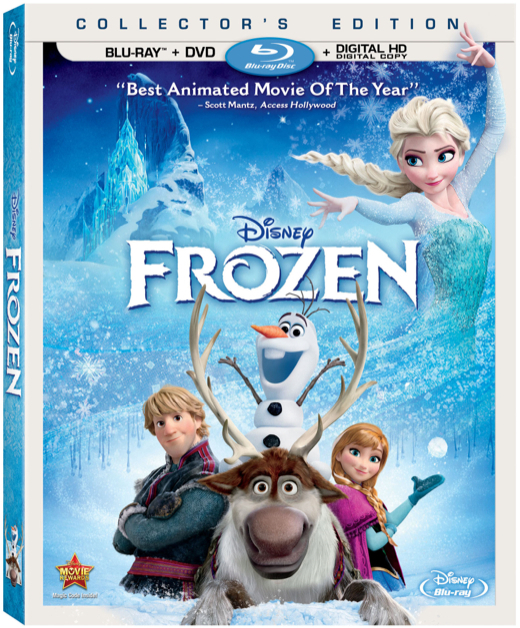 You can pick up Frozen at Amazon for $19.96. Disclaimer: Celeb Baby Laundry has not received any payment as a result of this review. I received a copy in order to facilitate this review. All opinions are our own.